Anchor Brewing Company of San Francisco gets credit for reintroducing Porter beer to the world, after its production declined to essentially nothing in the place of its birth, London, England. Strictly speaking, because Anchor owns the trademark for the term “Steam” as it refers to beer, this beer is not named Steam Porter. The “steam” part refers to the yeast it uses, namely, White Labs WLP 810 San Francisco Lager. 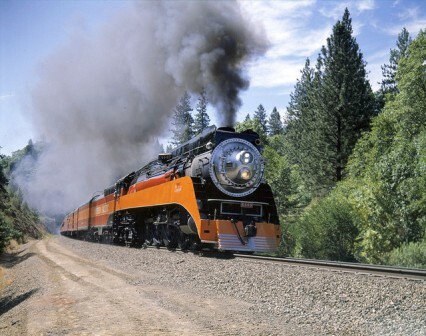 Plus, I can still remember the Coast Daylight steam train that ran from San Francisco to Los Angeles in the 1950s, and the porters that worked on it. A romantic beer in memory of romantic days. All Aboard! There’s no record of what the original porter beers tasted like, apart from descriptions dating from Edwardian times calling them “sweet, bitter, and a bit burnt all at once. Very warming.” The workers of the time, including porters, accustomed to a bland diet, are thought to have been attracted to the robust, astringent and bitter flavors rarely encountered in their everyday consumption. Some information exists though, regarding what they were made of. The earliest available recipes, dating from around 1750, show that the most prominent ingredients were pale malt and brown malt. This was not the same as the brown malt that is available today. Back then, the malt was processed by turning it out on a metal floor above a fierce wood fire. Despite its dark character, it retained a lot of sugar and malting enzymes, making it suitable for assuming a large proportion of the mash. Today’s brown malt is an English product still, but processed in drum roasters like its darker cousins the black malts. 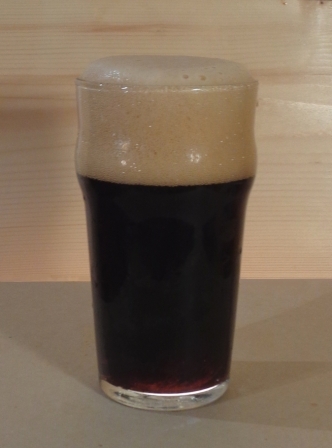 Black malts themselves now provide a significant addition to modern porter recipes. But porter is still distinct from stout. Significantly, historically accurate porter should not be opaque black. Rather, it is a very dark ruby red when it is brewed properly, as All Aboard! is. Besides a hefty addition of modern brown malt to provide a nice rich nutty flavor, All Aboard! uses five grades of crystal malt, plus Melanoidin malt to add more red color to the brown. Small additions of chocolate and black malts create layers of complex flavor. Munton DME provides the base sugars, and flaked barley creates a thick head. Historically, all manner of strange ingredients were added to create distinctive flavors, most notoriously Nux Vomica. Hangovers were inevitable. This recipe ventures less far. Instead, for interest it settles for 4 grams of gypsum, 2 grams of cracked Grains of Paradise and 12 grams of sea salt. Traditional Golding and Fuggles English hops provide bitterness and flavor, and homegrown Willamette hops add aroma. With a start at 16 Plato (1.064) this is a beer up to the demands of the most hard-working porter in Londontown. Aromas of nutty toasted grains combine with nice floral notes. Its malty-full richness, with a chocolaty bitter tang, contrasts with its residual sweetness. At 7.7% alcohol by volume it is an assertive but not hot beverage. Delicious and inebriating, it makes me want to pick up my bags and head for the station. This entry was posted in Uncategorized and tagged ale, beer, crystal malt, fermentation, homebrewing, Porter recipe, umami.